Buffalo sauce isn't as common as barbecue sauce as a burger condiment, but Buffalo's closing the gap. We ate 1.25 billion chicken wings during Super Bowl XVIII, a good portion of them with spicy Buffalo sauce, no doubt. The same was true of the 13.5 billion wings the National Chicken Council estimated Americans ate in 2012. Buffalo sauce has been with us for years and it seems to be everywhere. But in fact, last year it was "more everywhere" than ever. According to data gathered for BurgerBusiness.com by Mintel Menu Insights (above), the number of items on menus at quick-service, fast-casual and casual-dining restaurants jumped 17 percent over 2012. That's a significant one-year change for a product that already seemed fairly ubiquitous. 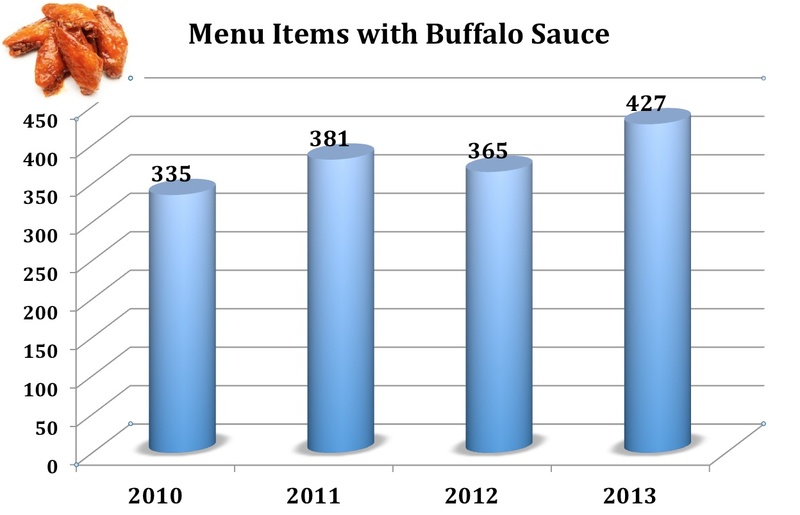 The number of menu products with branded Buffalo sauce increased last year, but only from 1 percent to 3 percent. That doesn't account for the whole jump, nor does continued growth of Buffalo Wild Wings and the others in the category, although that's obviously a factor. But I'll suggest that burger restaurants merit some of the credit, too. Buffalo sauce isn't as common as barbecue sauce as a burger condiment, but Buffalo's closing the gap. As burger chains expanded their chicken lineups, Buffalo sauce sneaked into the pantry. Now it's being used across the menu. For example, Carl's Jr./Hardee's not only created a Buffalo Blue Cheese burger with Frank's Red Hot sauce in 2013, they also used that topping to make last year's Buffalo Blue Cheese Crisscut Fries LTO side. Two of the five new sandwiches McDonald's added last year with the rollout of the Dollar Menu & More were the Buffalo Ranch McChicken and Bacon Buffalo Ranch McChicken. Those are its first use of Buffalo sauce as an ingredient other than as a dipping sauce. It's only a matter of time before the Buffalo sauce goes on a McDonald's beef burger now that it has a place on the ingredient list. Many burgers bars are already there. DMK Burger Bar offers The Kaner, named for Chicago Blackhawks' winger Patrick Kane. It's a grass-fed beef patty with blue-cheese dressing, house-made Buffalo sauce, chili-rubbed onion strings and shaved celery. It's on the menu only on days the Hawks play. Across town, Rockit Burger Bar recently tried a Black Angus beef patty topped with Buffalo-beer-battered bacon and blue cheese (below). Of course, leave it to Slater's 50/50 in California to create a Buffalo Buffalo Burger. On its menu last May, it was a seasoned ground-bison patty on a bed of shredded celery and carrots topped with a spicy Buffalo-sauce-infused sharp Cheddar cheese, grilled onions and jalapeño medley, all with house-made buttermilk ranch dressing and hot sauce. In December, stuffed-burger (or Juicy Lucy) specialist Blue Door Pub in St. Paul, Minn., invented the Buffalucy Blucy. 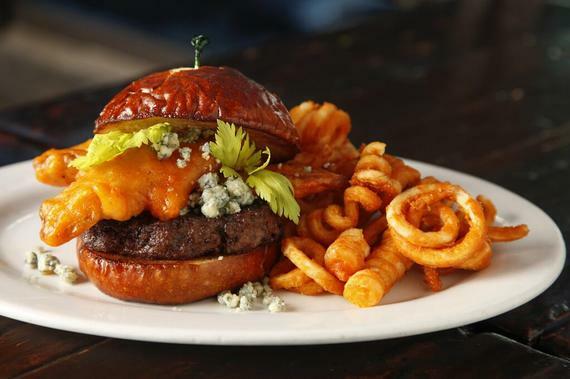 They began by soaking Cheddar and blue cheese in house-made Buffalo sauce then crammed the cheeses inside a burger patty. Meanwhile, they slow-cooked chicken in Buffalo sauce, pulled it and piled it on top with blue cheese crumbles and celery chunks. 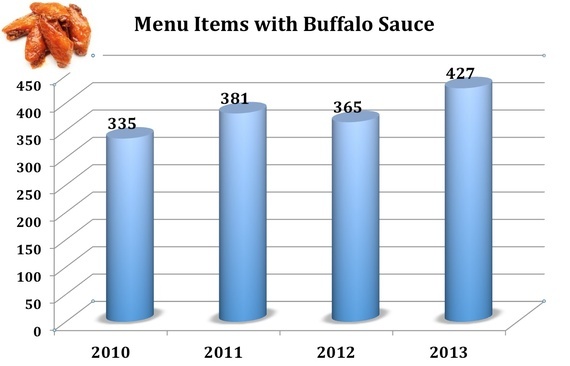 That alone could account for part of the increase in Buffalo sauce usage! And burger joints are likely to keep trying new Buffalo ideas.